There is an unwritten rule in journalism to avoid making Palestinians look bad collectively. Israelis, sure. Settlers, certainly. But Palestinians? No, they must be given every benefit of the doubt. The last PCPSR survey of Palestinians showed that they support a return to an armed intifada that would target Jewish civilians. Support for an armed intifada is higher in the Gaza Strip (60%) than in the West Bank (51%), among the youth between the ages of 18 and 22 years (65%) compared to those whose age is 50 years or higher (55%), among holders of BA degree (55%) compared to the illiterates (44%), among men (57%) compared to women (52%), among students (63%) compared to laborers (47%), among the religious (62%) compared to the somewhat religious (49%), among those who oppose the peace process (81%) compared to those who support the peace process (41%), and among supporters of Hamas (76%) compared to supporters of Fatah (36%). Yes, 41% of those who say they support the peace process also support murdering Jews. 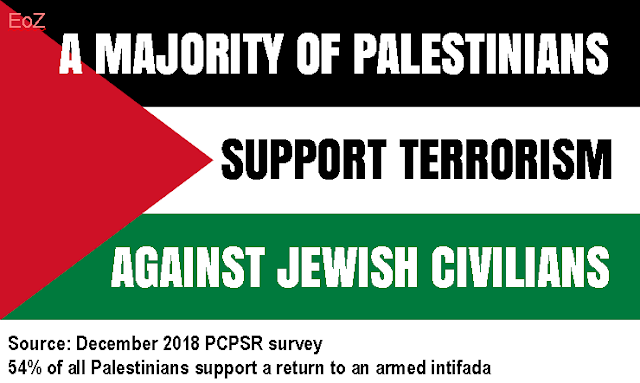 Previous surveys asking about support for specific terror attacks showed that the numbers go up when Palestinians are asked if they support the attacks on Jewish civilians in Israel. Previous surveys also show that the number who support killing Jews who live in Judea and Samaria are much higher, in the 80-90% range. This is a society that supports terror on the whole. By under-reporting this, the media is implicitly blaming only Israel for the problems in the region. The truth needs to be publicized, even if it makes Palestinians look bad. The media has an agenda and that agenda does not include facts.